Chicken Mushroom Pasta is an easy weeknight meal that is ready in less than 30 minutes! A delicious, super creamy white wine based sauce loaded with mushrooms and tender, perfectly seared chicken. 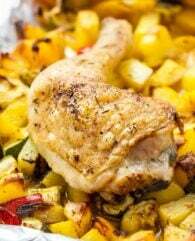 We love easy weeknight dinners that can be made quickly and taste amazing like Healthy General Tso’s Chicken, Baked Chicken Legs with Potatoes, and Instant Pot Chili. 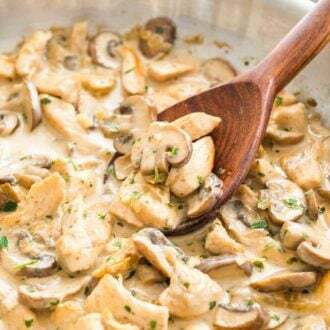 Creamy Mushroom Chicken Pasta is one of our favorite meals because it’s so easy and quick to make from scratch. 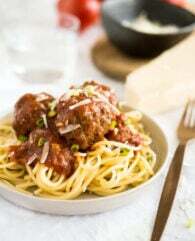 Simple ingredients make this dish a budget-friendly weeknight dinner but it also makes a delicious meal for date nights. White wine gives the sauce a flavor kick and heavy cream makes it rich, creamy, and comforting. I probably love to cook with wine as much as I like to drink it! Wine adds so much flavor and the alcohol evaporates during cooking. You only need half a cup of white wine for the sauce so there is plenty leftover for you to enjoy with your dinner. The white wine sauce is so creamy and flavorful, you won’t regret adding a little bit of your favorite white wine. 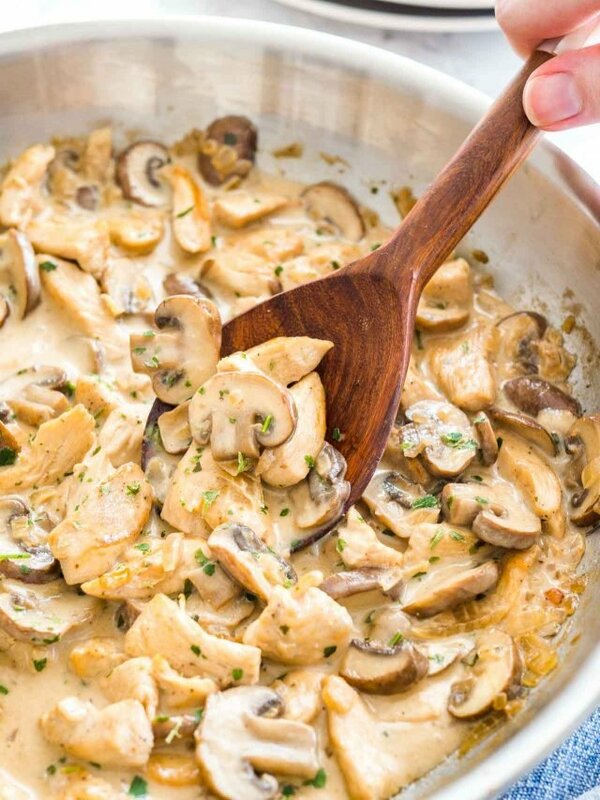 This easy chicken in white wine sauce with mushrooms will sure become a family favorite! Serve it over a bed of freshly cooked pasta for easily one of the tastiest meals you’ll ever make. If you don’t like or can’t consume white wine you can use more chicken stock instead. Choose a large heavy skillet that is the right size for the amount of chicken you have. The skillet shouldn’t be too small because we want the chicken to brown and not steam. Give the chicken a good sear! This adds a lot of flavor. Taking the chicken out of the pan and adding it back later keeps it from getting overcooked and dry. Fresh mushrooms work best for this recipe! They hold their shape and add some nice texture and color to the sauce. To clean the mushrooms you can give them a shower, but don’t let them soak. It’s totally ok (and much easier) to wash them and the amount of water they absorb is totally negligible. Pat them dry after washing and you’re good to go! To save time you can also buy fresh pre-sliced mushrooms at the grocery store. Instead of heavy cream, you can also use half-and-half in this recipe. Instead of adding cornstarch and water you can also add a bit of pasta water to the sauce. The water contains starch from the pasta. Spinach would make a great addition to the sauce! To make chicken mushroom spinach pasta just add a few handfuls of spinach to the sauce when you add back the chicken. 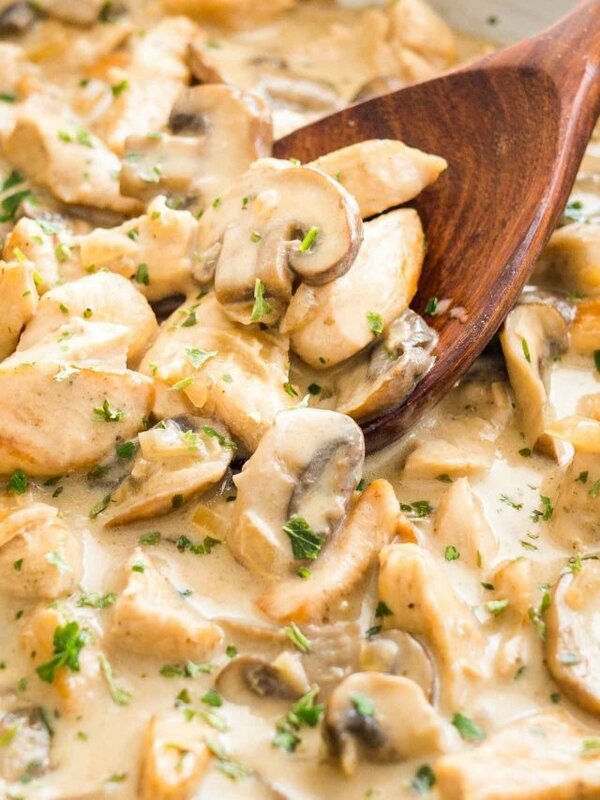 This chicken mushroom white wine sauce for pasta would also taste great with rice. 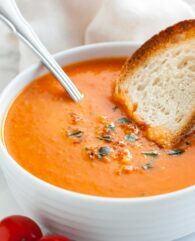 I also often serve it straight up with rustic bread – so easy but so delicious! I use and love, it’s super affordable and so versatile. , it saves so much pantry space and 1 tub make 3 1/2 cups broth. Creamy Mushroom Chicken Pasta is an easy weeknight meal that is ready in less than 30 minutes! 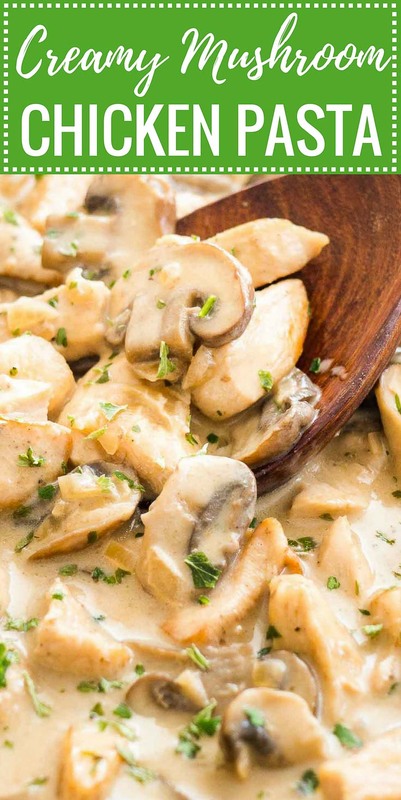 A delicious, creamy white wine sauce loaded with mushrooms and tender chicken. In a large skillet heat 1 tbsp oil and 1 tbsp butter together at medium-high temperature. Season the thinly sliced chicken with salt and pepper. When the pan is hot and the butter melted fry chicken until browned and cooked through about 2 minutes each side. Take cooked chicken out of the pan and set aside. In the same pan add 1 tbsp oil and cook the onion until lightly browned, about 2-3 minutes. Add the sliced mushrooms and cook until tender, about 2 minutes. Add white wine to the pan and let simmer until reduced by half. Add chicken stock and cream. In a small bowl combine corn starch and water. Stir until starch is completely dissolved then add to the sauce. Bring to a boil and let simmer without a lid at high heat for about 2-3 minutes to reduce and thicken. Add the cooked chicken back to the pan and cook for 30 more seconds. Stir in parsley and season to taste with salt and pepper. Recipe originally published July 2017. Updated with recipe video and improved instructions. 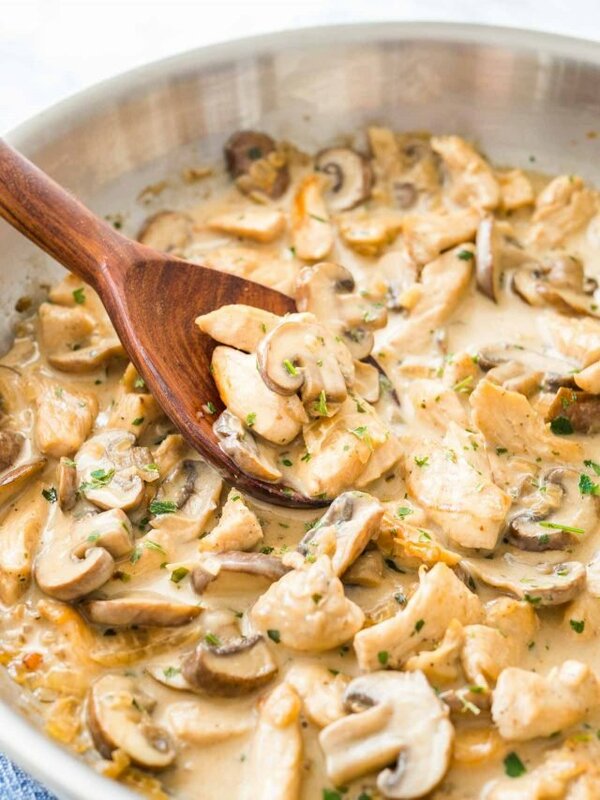 WANT TO TRY THIS CREAMY MUSHROOM CHICKEN PASTA? PIN IT TO YOUR DINNER OR RECIPES BOARD TO SAVE FOR LATER! Delicious. Will make this again & again.